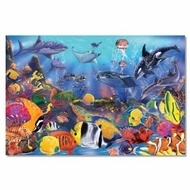 Piece together tons of fun with this puzzle that features an undersea adventure. This colorful, detailed Underwater-themed floor puzzle is made of heavy-duty cardboard with an easy-clean surface that helps keep the puzzle looking new. 48 pieces. Measures 36" x 24".